I hit a difficult time in the journey. Pain is my constant companion. Lost a bit of my progress and just want to quit. Sorry to say this may not be so upbeat. I have felt defeated, hopeless and just ready to stuff myself with the foods I love and miss..bread and butter and chocolate, oh and lets not forget steak and burgers! Yes, I hit a rough patch and wanted to quit, to get off this journey. At night, when the house is quiet and my husband is asleep, and my daughter is closed up in her room, supposedly asleep, tears drip off my face. I lay here alone in the dark and cry. My emotions are allowed to just be what they are in the dark. I miss my Sissypoo so much. I miss being up and doing things for myself and my family. I miss shopping, the beach and going out to eat. I miss being pain free and able to walk and drive my car. I worry over how to keep on doing this, do I even want to. Where will the money come from. What will happen to me? Then there is my husband. The one who stands beside me, carries me, holds me, loves me with every deed and look,and prays for me. When I am weak he stands in for me, showing me how far I have come, how YHVH has not forsaken me. His love and faith keep me going when I want to quit. My daughter, she finds food to tempt me to eat. She makes me laugh and shares her experiences from work with me. My granddaughter fights to help me. She brings joy to my day with her sweet spirit. I am thankful for my son and his wife. They drop whatever it is they are doing to help me, even sitting in the hot sun with me to encourage me along. Wonder if they know how much it means to me when they share themselves with me. Then there are the friends that are family to me. Their prayers, texts, emails and such, well they make the hard things bearable. They give me hope. So, I went a few steps back. I need to use the walker again. At times my leg will not move, and if I force it, the pain shoots up the back and into my hip, around to the front. A pulsing, throbbing pain. One that keeps me up at night. One I try to hide. One that takes my appetite away. Last night I quit. I just told my Eddie that I just can’t do it anymore. Ah that man is a true gift from my Abba. His love carries me when I am too weary to take another step, to do another enema, to drink another green drink. Then…when I am still…YHVH whispers to the center of my being…He knows…nothing is hidden from Him. He sees each tear, hears my desperation and knows my heart better than I do. He reaches down from His throne to touch me and breathe life into me, filling me with peace. When I am weak, He is strong. 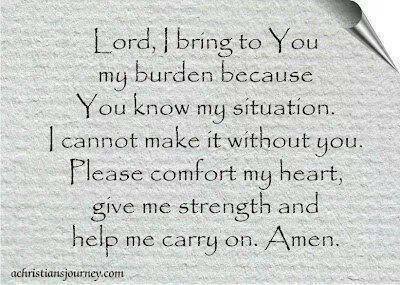 It is not my strength that will carry me through this journey, it is His. So for today, I will be carried. Today I will lean on my husband and trust my G-d.
Cancer is ugly. Pain is wearying. Love is comforting. Hope is pushing up through this storm. Faith is facing today.